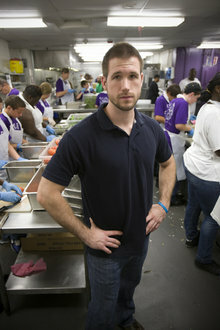 For Alexander Justice Moore ’07, DC Central Kitchen is not only a place where he can feed others, but also an environment where he is intellectually and spiritually fed. As a politics major at Ithaca College, Moore learned about the systems that lead to global problems such as poverty and hunger. Now, Moore said he uses his education as a framework for operating DC Central Kitchen, a Washington, D.C., nonprofit that aims to rebuild urban food systems through social enterprise. Today, DC Central Kitchen is widely recognized for being a leader in breaking the cycles of poverty and hunger. Earlier this year, Moore made his way back to IC for a public reading of his book, The Food Fighters: DC Central Kitchen’s First Twenty-Five Years on the Front Lines of Hunger and Poverty, which speaks about the relevance of DC Central Kitchen in this era. The book was published last April and is now required reading in Patricia Spencer’s grant-writing class. Moore said his book was inspired by Robert Egger’s book, Begging for Change: Dollars and Sense of Making Nonprofits Responsive, Efficient, and Rewarding for All. Moore read the book, written by DC Central Kitchen’s founder, for Spencer’s class at IC. It’s what made him choose to work for Egger. “It changed the way that I viewed the world and it was a perfect capstone piece to my Ithaca experience,” he said. With his new book on the same class syllabus, Moore’s revelation came full circle. “It was very cool to see that my book was available in the very same class that changed my life a decade ago,” he said.